Shari and Bob split their time between their spring/fall home in San Francisco, their winter/summer home in Lake Tahoe and their world traveling. Between business and pleasure travel, Bob and Shari have visited more than 80 countries. 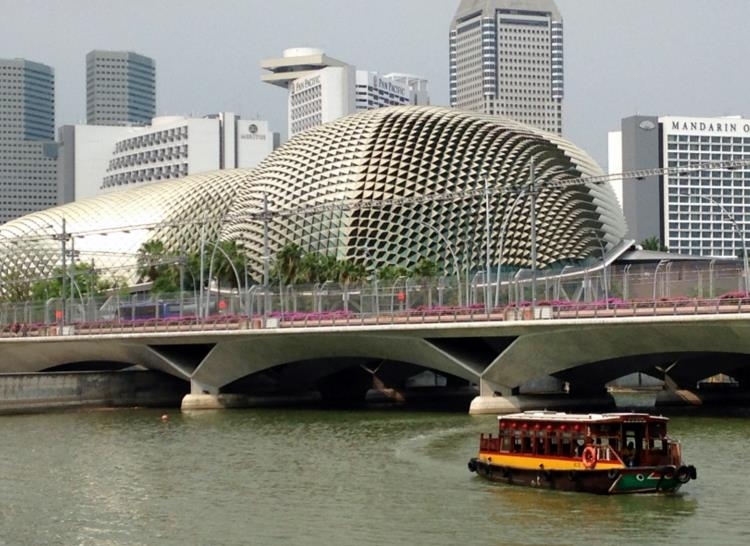 Their 2014 trip to Singapore was a combination of work and pleasure. As Bob finished his last consult on an 8 year series of contracts with the Singaporean Ministry of Education, they extended their stay by a weekend to celebrate at the iconic Marina Bay Sands Hotel. The celebration was capped off by a romantic meal at the Town Restaurant in the equally iconic Fullerton across the bay from the Sands. …with the reading of Lee Kwan Yew’s book, From Third World to First: The Singapore Story 1965-2000. 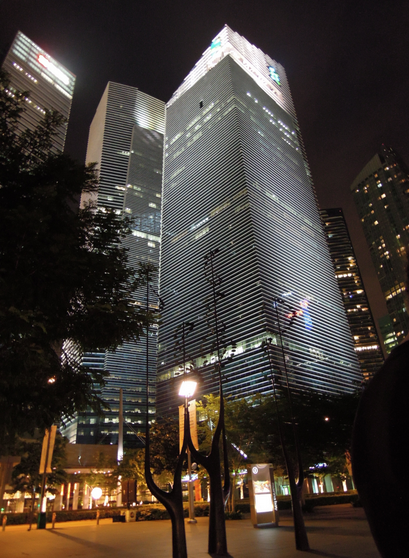 I have visited Singapore 3 times: in 2000, 2004, and now 2014. What follows are my personal impressions, and summary of my research. 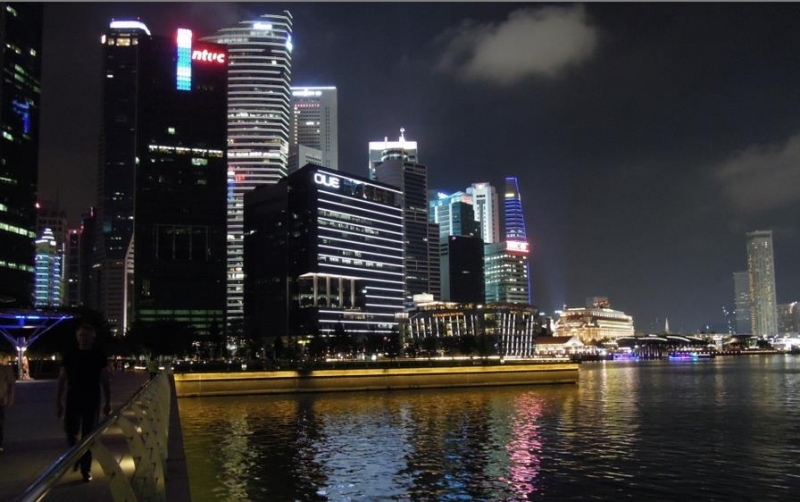 Singapore became independent from Malaysia in 1965 and starting with the vision and leadership of its founding father, Lee Kwan Yew, in 50 years it has converted itself from a largely mosquito infested swamp land to one of the world’s most outstanding and beautiful countries. It leads the world in education, banking, and shipping, and has created an everyday existence of unrivaled cleanliness, safety and stability. There are vast amounts of green space, parks, forests, and gardens. The factories and less attractive places (like the trash and recycling center) are largely hidden behind tall walls and gates. It is clean, litter and graffiti free. The architecture of the commercial buildings is creative and often stunning. The downtown was built on reclaimed (landfill) land and surrounds a pristine marina. 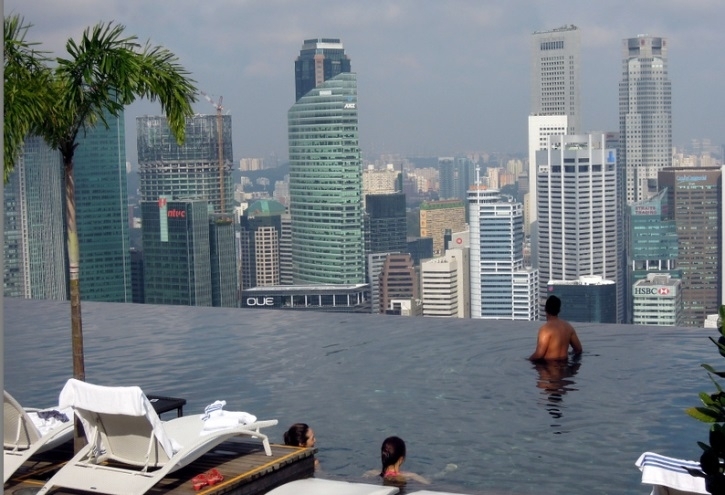 The Marina Bay Sands Hotel – the world’s most expensive building at 4.7 billion US is 57 stories high with an infinity pool at the top (picture at top). We stayed here two nights in celebration of Bob’s retirement. It was a splurge to stay there…but totally worth it. 40% populated by foreigners, it has often been called the “rich person’s playground”. But personally, I would not want to live here. Beyond what I consider oppressively hot climate, it is the “sameness” that drives me wacko. By far the prevalent housing is miles and miles and miles of high-rises, largely uniform, government built residential housing. There are about 6 basic floor plans in the over 1 MILLION units. While neat, clean, and a good way to house a large population on a small island while preserving maximum green space, I find the sheer volume of cookie cutter housing depressing. The population seems like the offspring of a Chinese mother tiger – success-obsessed parents, hard willed and tough, alternately rewarding, coercing, punishing their offspring into compliance. While a foreigner can enter the beautiful downtown casino free of charge, a Singaporean citizen has to pay a $100 entrance fee, but if the Singaporean wants to go to museum or cultural event, they get a heavy discount off the tourist rate. Here you get constantly barraged by signs and billboards encouraging “appropriate” behavior. 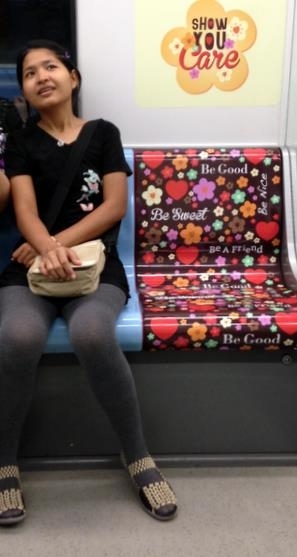 Below, the seat with flowers says “Be Sweet,” “Be Good,” “Show You Care” presumably so you let someone have your seat or suffer there in guilt. Suffer caning and 3 years of imprisonment for graffiti, which means there is no graffiti. Litter? Risk is $1,000 fine and 12 hours of picking up litter wearing a bright orange jersey. Jaywalk? Starts with a $20 fine for first offense, then repeat offenders can be jailed for up to 6 months and fined $2,000. (Plus the jaywalker is at fault if he is hit by a car). Penalty for eating or drinking in the subway or bus – $500. Chewing gum – don’t even think about it. And as for drugs or weapons – you might be hanged (seriously). Neither Bob or I saw a policeman or guard the entire time we were there – so we think it is the Singaporean culture …even though they might complain about the rules – they follow them. (When we engaged cab drivers in conversation they quickly complained about ‘too many rules’). But the result is the streets are clean and beautiful, the 1987 subway looks brand new inside, and with the exception of the accumulating dirt on the outsides of the buildings – most everyplace is neat and clean. 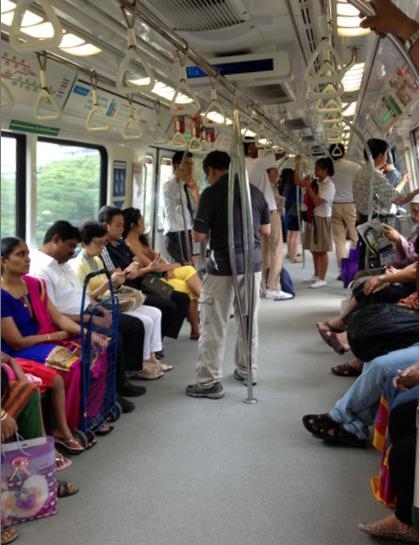 Transportation is easy here – buses and MTR (subway) pretty much cover the entire island. I explored the entire island on less than $8.00 …but, other than downtown, it is all the same here no matter where you go. 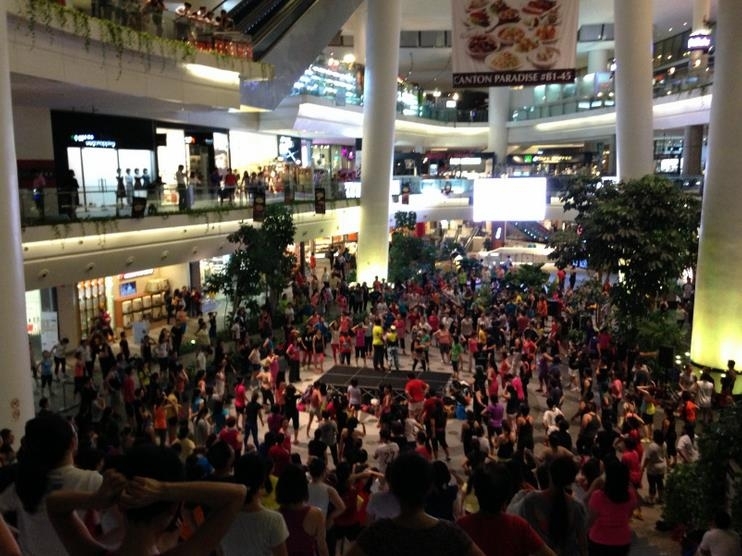 For fun, Singaporeans flood to the malls and masses participate in wonderful dance/exercise which looks like it is led by whoever wants to get up on stage and take the lead. They often go to one of the tranquil, largely deserted islands for family outings on the beach, or go to the island of Sentosa – which boasts a Universal Studios, and activities such as indoor sky diving, Segway tours, and water sports. 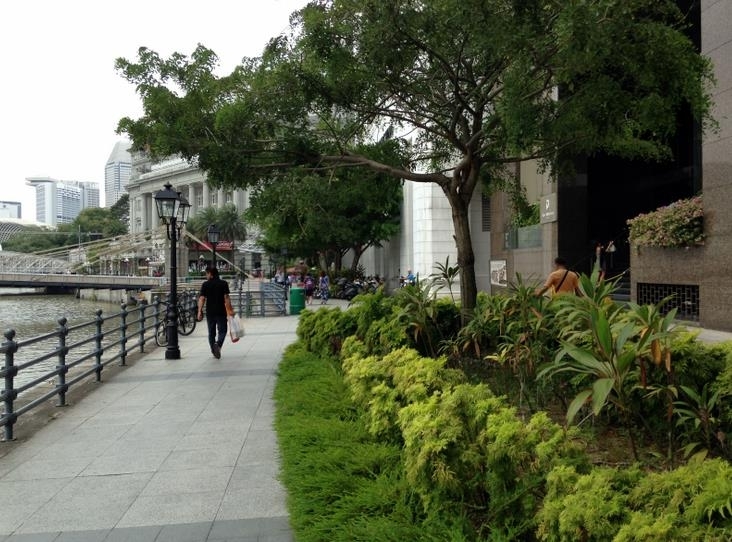 Singapore is beautiful, and brilliantly (and strictly) managed, yet it IS an island. But the only views are from buildings. If I lived there I’d miss the ability to drive to the mountains, the beaches, the desert. I’d miss the uniqueness of different cities, different neighborhoods, different views, and different landscapes. I’d miss the ability to hop in a car and drive, or a plane and reach hundreds of different destinations easily. Although I like the result of Singapore’s strict rules, they made me nervous. It is difficult to explain why I felt trapped…but I did. I didn’t like the feeling that Tiger Mom was watching me. I do want to be able to cross the street on a red light when there are no cars in sight. And I guess I do want to be able to do a U-turn when I’m not supposed to. And beyond the rules, I’d miss Mexican food. Shari and Bob celebrate their 20th year of matrimony this year. They met at a singles event in San Francisco in 1995. After long periods of single-hood (13 years in the case of Shari and 18 in the case of Bob), Shari won Bob’s heart that night with her charm, poise and radiant smile and they were married 6 months later. Shari retired young, in 2001, after a successful career as one of San Francisco’s top Realtors. It took Bob a while longer and after a long career as a grade school teacher, university professor, Silicon Valley research scientist and international consultant, Bob retired in the fall of 2014. He spends his free time as a fashion photographer in San Francisco and now publishes in fashion magazines instead of academic journals. His website is: www.BobKozmaPhotography.com. PS. From Tom and Sheila. Bob and Shari are the friends who first recommended the home exchange concept to us! They often use a home exchange as unique way to experience the local culture.